Luxury Direct Oceanfront Condo! Gorgeous!! Make your next vacation truly incredible! Rent our completely furnished, luxury, 3 bedroom, 2 batch condominium directly on the great Atlantic Ocean. Located at 'Chadham by the Sea' on the non-driving end of New Smyrna Beach, Florida. We represent the finest luxury offering on New Smyrna Beach. Long term rentals are welcome! 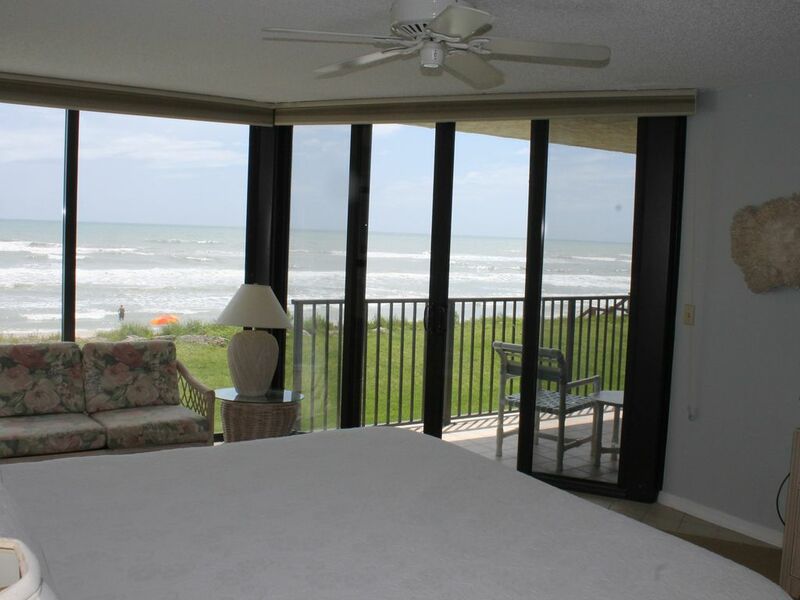 Our second-floor, oceanfront condominium has many upgrades that you will not find anywhere else on the beach. From gourmet kitchen appliances and elegant decor, to 320 thread count Egyptian cotton sheets, to both foam and down feather pillows, our unit is fully furnished for your comfort and pleasure. Our condominium is built and maintained to capture the very best Florida living and enjoyment. Please check out all of the information we have to offer, for a wonderful oceanfront vacation! We are Just 75 miles from Walt Disney World and other Orlando area attractions! Beautiful beaches, quiet, fantastic views of the ocean from the unit, small quiet town. 1 king, 1 queen, 2 twin, 1 sleep sofa. Fully equipped kitchen, gourmet cookware & knives, Williams-Sonoma dishes, high efficiency washer/dryer; iron/board; ceiling fans; elevator accessible; Egyptian cotton bedding. We really enjoyed our stay! The owner was so nice and helpful! Thank you helping us make some great memories! My daughter and her family stayed here while I was in a nearby condo. It was a perfect location right on the beach, nice pool. There was a small crack in one of the large windows which caused the whole window to fog up. It was not a big problem as it was on the side and is scheduled to be fixed as soon as possible. It was well stocked and with 2 small children, they had everything they needed. Great place with all the amenities. Owners are responsive and helpful! Loved being so close to the beach! It was very spacious. Can't wait to go back. This is great place to take your family for a relaxing beach week! It had everything you would need. Loved being so close to the beach. Can't wait to go back! We have found our new spot. Very nice, quiet condo. Has all the comforts of home. We loved our condo. The only negative thing I would say is needed better lighting in the bathrooms. The condo had all we needed to make our week very enjoyable. Activities (on site or nearby): tennis court, shuffleboard court, barbecue grill, heated swimming pool, surfing, jet-skiing, deep-sea fishing, five golf courses nearby, Canaveral National Seashore Park (less than a mile away), Walt Disney World, Magic Kingdom, EPCOT, MGM Studios, Animal Kingdom, Universal Studios, Universal Studios Islands of Adventure, Sea World, Kennedy Space Center, Daytona International Speedway. Directly across the street from our condo is the beautiful Intra-Coastal waterway. You can rent a boat (with or without a captain) and tour the waterway, see the manatees, the dolphins, and all of the natural sealife in it's own environment. Fun for adults and kids alike!